There’s a reason we call the best kitchen knives “chef knives.” A good chef is a multitasker, so a good chef knife is designed to handle multiple jobs. Think of all the slicing and chopping involved in a beef stir-fry or a chicken noodle soup. You want a single tool that can handle it all. MAC MTH-80 Professional Series 8-Inch Chef Knife with DimplesA popular all-purpose knife among both beginners and professionals. The “mighty MAC” was the clear favorite of our testing team — and widely praised by the experts we spoke with. It’s maneuverable enough to chop mint leaves, slice carrots, and peel butternut squash, offering clean cuts without requiring perfect form. It feels comfortable for both large and small hands, and its medium-weight balance means it’s neither too light nor too heavy (we’ll go ahead and call it the Goldilocks of knives). A half-bolster helps you maintain a professional grip, and dimples prevent food from sticking to the sides of the knife as you chop. Retails at $175. The Shun has a weight and heft similar to the MAC and is versatile enough to handle a range of dicing, slicing and chopping — but only if you treat it right. The knife is covered in an outer layer of Damascus steel, which provides a gorgeous appearance but makes the knife edge more likely to chip if you don’t use proper chopping technique. Like the Mac, the Shun is a half-bolster knife, helping you maintain a professional grip without the added weight of a full bolster. Several of our novice cooks had trouble holding the Shun comfortably, but testers who were already experienced in the kitchen loved its elegant performance. The Shun is slightly more expensive than the MAC, retailing at $182, and a good pick for those who’ve mastered the basics. Bulky but lightweight, with an easy-grip handle. If you want a quality knife but don’t have a lot of money to invest, the Victorinox is our pick, retailing for around $45. While half an ounce lighter than both the MAC and the Shun, the Victorinox is large — wide blade, wide no-slip plastic handle — and designed to take on big jobs. (Think large cuts of beef, not chicken tenders.) Our testers found it comfortable and easy to use even when chopping herbs, but noticeably bulky compared to the Shun and MAC. The Victorinox’s price point also means the blade might not hold an edge as long as a more high-end knife. If you’re just beginning to explore the world of fancy kitchen equipment, consider it a test run: try it for a few months, and if you find yourself using it all the time, think about upgrading to the MAC or the Shun. Two other options, the Wusthof Classic 8 and the Global G-2 8-Inch Chef's Knife, are also worth a mention. The Wusthof Classic, like the Victorinox, is geared for heavy-duty chopping and cleaving. It’s the heaviest knife that we tested (9.1 ounces, versus the Victorinox’s 6.6 ounces) and was a favorite among testers with large hands, who liked its extra heft. The Global stood out for the opposite reason: It’s extremely lightweight, at only 5.9 ounces, and most suited for vegetable dicing, but some small-handed testers preferred it over our top picks. The world of kitchen knives is vast. Popular brands like Wusthof offer several lines apiece, and that’s before you consider whether you want an 8-inch, 9-inch, or 12-inch blade (we decided on 8-inch). And there’s an avalanche of additional options: Do you want a full bolster, half bolster, or no bolster? How about a full tang? A granton edge? We were admittedly overwhelmed. That said, some knives and some brands consistently outperform others, so we knew that “best chef knife” wasn’t entirely subjective. To narrow the playing field, we did some research to identify the brands with the best reputations (which included asking our experts which brands they preferred). Then we contacted these companies to learn which of their knives were also bestsellers. Over the course of several weeks, this allowed us to cull a starting list of 170 knives down to 11 final contenders. Then we (carefully) carried those knives up to our testing kitchen to see which ones would make the cut. We chopped and we diced. Herbs: Can the knife cut mint leaves without bruising them? Carrots: Can the knife slice carrots without splintering the slices? Butternut Squash: Can the knife both slice into, and carefully peel, a butternut squash? What's the best way to hold your knife?According to Bob Tate, knife sharpener and owner of Seattle Knife Sharpening & Supply, you should hold your kitchen knife in a pinch grip: grip toward the front of the handle, with your thumb and your curled index finger pinching the base of the blade. Right away, Brownstein identified a problem with our plan: all the knives we’d chosen were going to succeed. “These tests determine whether a knife is sharp,” she explained, and since our knives were quality brands being used straight out of the box, they were pretty much guaranteed to be factory sharp. Brownstein told us to focus on how the knife felt in our hands as we performed each task. Were we able to grip it comfortably? Was it too light or too heavy? Did the spine rub awkwardly against our index fingers as we chopped? These are the details that can make or break a cook’s relationship with their kitchen knife. Our testing group comprised a range of ages, body types, and hand sizes — not to mention vastly different levels of cooking experience — so we were surprised to find that yes, there actually was consensus as to which knives felt best. The MAC MTH-80 Professional Series 8-Inch Chef Knife with Dimples is the brand’s “most popular knife for everyday use” — and it was the most popular knife in our testing room. It was easy to handle, comfortable for most hand sizes, and allowed us to complete a full range of chopping, slicing, and peeling. One tester reported that the MAC felt “precise” when chiffonading mint leaves, and another noted “very clean cuts” as she halved her butternut squash. This balance might have been helped along by the MAC’s half-bolster. Two of the three full-bolstered knives that we tested got dinged for feeling “clunky” or “heavy,” while the the Global G-2 8-Inch Chef’s Knife, which has no bolster at all, felt “almost too light” to some of our testers. Japanese vs European-style? Japanese-style knives are lighter, with thinner blades; European-style (or German-style) knives are heavier, with wider blades. Neither is necessarily better. It boils down to personal preference and the type of cooking you're likely to do. “The MAC knife is one of my favorites,” Brownstein told us. “The weight/balance is perfect for me. It’s wide enough to keep your food together and it keeps a great edge.” Tate agrees that the MAC is good for smaller hands and for people who want to make thin cuts. It’s a Japanese-style knife, which means it’s going to be smaller in general than a European-style knife. If you plan on cutting up, say, a lot of chicken bones (or if, like a couple of our testers, you just want more finger protection), you might consider a heavier knife with a full bolster, like the Wusthof Classic Chef Knife, one of our runners-up. The MAC’s granton edge — aka the “dimples” along the side of its blade — are designed to prevent food from sticking to the knife as you chop. Brownstein noted that while these divots don’t make a huge difference, the best way to keep sticky food off is to rub the blade of the knife with a little plain vegetable oil before cutting things like garlic or potato. But testers did notice that the MAC accumulated fewer bits of carrot and mint than other contenders. The final selling point? We asked Brownstein which knife she’d like to take home with her, as a thank you for helping us with the tests. She chose the MAC. Shun Classic 8″ Chef KnifeGorgeous, but with a steeper learning curve. The Shun Classic Chef Knife was another testing room favorite. The packaging was so beautiful it caught our eye before we even took it out of the box: the Shun seems designed to elevate dinner prep to an artistic event. The Shun, like the Mac, is a lightweight Japanese knife with a half bolster — no chicken bone chopping, please. “I love Shun knives,” Brownstein told us. “They’re beautiful — like a functional art piece — with great balance and good quality steel.” And our testing team agreed. The knife “feels and looks elegant,” one tester told us, and at 7.3 ounces, with a blade that’s 1.8 inches wide, it had a heft and balance similar to the MAC. But the Shun is clearly designed for people who already know their way around a kitchen. Several novice cooks in our group struggled to maintain a comfortable grip, with one lamenting that “it just doesn’t feel right.” The knife’s spine was also less forgiving, rubbing against index fingers that slid out of a proper pinch grip. That said, the knife got an overwhelmingly favorable response from experienced chefs — and even novices liked it better than the Japanese-style Miyabi knives we tested, which had blades and handles that felt stiff and clunky. In fact, the Shun’s handle was a standout feature. Rather than being totally round (like some traditional Japanese knives), it’s D-shaped: the curve of the D fits into the curve of your fingers as you grip the knife. But here again, Shun notes that the handle is designed with a professional pinch grip in mind. If you’re not maintaining proper form, your mileage may vary. Left-handed? A note about Shun's handles. The curse of the Shun’s ergonomic handle is that it’s designed for right-handed people. The company offered a “reverse grip” for lefties but discontinued the line, stating that many lefties actually prefer the standard handle. This raises a whole new set of questions (why offer ergonomic handles at all if they don’t make a difference? ), but we’re begrudgingly inclined to believe Shun: our left-handed tester had no trouble with the knife, despite her general dislike of kitchen equipment for righties. That said, we’d suggest trying it out in person before you buy. The trade-off for the Shun’s visual elegance is that the knife also requires careful maintenance. The handle, for instance, is made of a wood/plastic composite that’s more delicate than the polymer or Fibrox of picks like the Wusthof and Victorinox. Brownstein noted that too much water exposure would be bad for it; you’ll need to dry both knife and handle thoroughly after use. Victorinox Fibrox 8-Inch Chef’s KnifeInexpensive, and offers a solid performance. The Victorinox is an excellent option for people who want to start cooking regularly but aren’t yet ready to invest a lot of money, offering a solid performance for around $45. It’s a European-style knife, meaning the blade is both wider and slightly thicker than the Japanese-style MAC and Shun. It only weighs 6.6 ounces (lighter than both our top picks), but the blade measures 2 inches across at its widest point. It also didn’t feel quite as maneuverable as the Shun or the MAC. One tester noted that she “didn’t like the large handle for cutting small things,” although it was “great for large things” like squash. 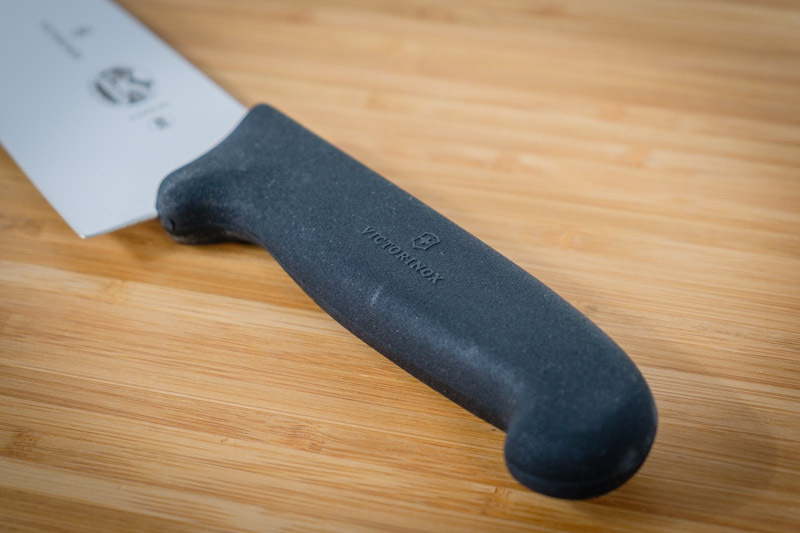 Tate agrees that the Victorinox is the best knife for people who are on a budget (although he, like our testers, prefers a wood handle to the Victorinox’s plastic). Brownstein told us that commercial kitchens often order this knife for their line cooks. If you’re looking for low cost but respectable quality, the Victorinox is a good place to start. We considered one other budget knife during hands-on testing, the Zwilling J.A. Henckels Forged Razor Series 8″ Chef’s Knife, which retails for about $40. It looks more impressive than the Victorinox, with a smooth, contoured handle that testers loved. But we were less impressed once we hit the kitchen. One tester noted that “the Victorinox did a better job chopping and peeling” across all categories. Another reported that the Zwilling required her to “saw” in order to cut her squash in half. Both the lightest knife and the heaviest knife in our testing group got high marks from our testers although they weren’t as universally popular as our top picks. Wusthof Classic 8″ Chef KnifeA European-style knife with a full bolster, for heavy-duty tasks. Global G-2 8-Inch Chef’s KnifeA lightweight knife with no bolster. On the other end of the scale — literally — is the Global G-2 8-Inch Chef's Knife, weighing a mere 5.9 ounces. “I’ve always liked Global,” Brownstein said, explaining that this lighter knife is good for people who are more likely to prep for a single meal than spend long stints prepping as it can leave a sore spot on your hand after a long day of prep. Because it is all metal it is easy to maintain. Thanks to great quality steel, it also keeps a wicked edge. Our testers agreed that the Global felt sleek and easy to handle: slicing carrots was like “cutting butter.” But it tended to be most popular with small-handed testers (one of whom flat-out told us, “I want this knife.”) Others found it a little too lightweight and didn’t like its lack of a bolster, which left fingers feeling exposed. Chef knives are versatile, but you’ll still need a few specialty knives. As a rule of thumb, if the purpose of the knife is in its name — bread knife, filleting knife, even steak knife or grapefruit knife — it marks a task that will be difficult to accomplish with an all-purpose chef knife. If you’re still building up your collection, a serrated bread knife to cut loaves of bread, and a paring knife — which has a very short blade — for tasks like paring apples or potatoes are good places to start. Depending on the cuts of meat and fish you use, you may eventually want to invest in a boning knife or a filleting knife as well. Keep your chef knife properly sharpened. Honing and sharpening are not the same. A knife honing rod, or honing steel, is designed keep your knife functioning well between sharpenings. Honing straightens the edge of a knife, while sharpening literally grinds away part of the steel to produce a sharper edge. There’s a right way and a wrong way to chop. Imagine your cutting board is a clock. Most people point their knife toward noon, placing the food horizontally across the cutting board. But if you angle your knife so that it points towards 10 o’clock (and adjust your food to stay parallel), the knife becomes an extension of your forearm and is easier to handle. Think about your cooking style. Do you regularly chop up whole chickens and large cuts of beef? If so, a full-bolstered European-style knife might be the best fit. More likely to dice veggies or butterfly chicken breasts? Japanese-style may feel more intuitive. Take a test drive. If you’re unsure about your preferences, it’s a good idea to hold a few options in person. The best chef knife is the one that feels right to you. Treat your knife kindly. One expert we spoke with has a chef knife she’s used since she was fifteen. Yes, a good knife is an investment — but if you treat it well, it’s a long-lasting one.